Most people want to live healthier lives. One of the most important components of a healthy life is a healthy diet. Typically, the first change people make to their diets is adding more fruits and vegetables. So, here you are, on a quest for healthy living, you push your empty grocery cart proudly into the produce section, you see out of the corner of your eye, the organic section. Most time you just pretend that section doesn't exist because you have a budget and a carrot is a carrot. Right? Well a little right. Now, this post isn't for the person who is dedicated to eating all organic all the time. You folks can take the month off! This is for those of you who occasionally buy organic or never buy organic. 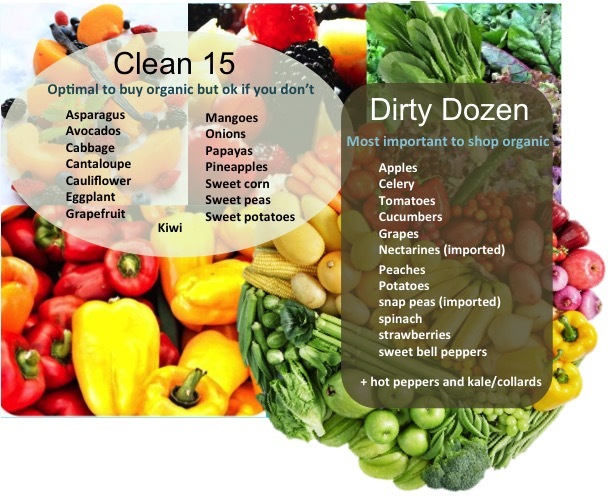 I just want to give you guys a quick crash course in why you should consider buying organic and to give you a cheat sheet on the dirty dozen and clean 15. First of all, let’s talk about pesticides. Pesticide residues are potentially the most harmful to children and pregnant women. More and more research is being conducted to better illustrate the dangers these residues may have, but some have already established a link between children exposed to pesticide residues and ADHD. Other studies have begun to demonstrate how even low exposure to pesticides can interfere with proper development in children. (1) To be clear, there are plenty of people who consume non organic produce and lead perfectly healthy lives, but when it comes to my health or my family’s health, I’d like to err on the side of caution. I would also like to mention an article I recently read opposed to buying organic. While he brings up a lot of great points, I disagree that buying organic is putting faith in a broken system. Even if there are some dishonest organic farmers, I still believe buying organic is the lesser of the two evils. There may be a small possibility that your organic produce might have some pesticide residues, but that same produce is guaranteed to have those residues if you buy it non organic. Most times it is assumed that the main distinction between organic and everything else is that certified organic produce/products have to adhere to a strict set of guidelines concerning pesticide use only, but it is a little bit more than that. Secondly, organic produce tends to be a bit healthier than its non organic counterpart. Organic produce has been shown to have a higher antioxidant content than non organic. "Many of these compounds [antioxidants] have previously been linked to a reduced risk of chronic diseases, including CVD and neurodegenerative diseases and certain cancers..." (2) Also, buying organic ensures you do not consume genetically modified foods (GMO). GMOs do not qualify as an organic crop. The studies on GMO crops and human health consequences are still lacking (there are quite a few troubling studies in regards to rats), but while the jury is still out, I say avoid them when you can. I honestly hope in the end they are perfectly safe for everyone but right now I don’t have the confidence to say that. One of the major issues with GMO crops is that they are typically modified to withstand high doses of Round up without dying. This pesticide has been shown to work its way into the crop itself and so refer back to the paragraph on pesticides for my take on those. Here, I am not even taking into account the environmental impacts nor the health impacts on those who spray the chemicals on the crops. That can be a whole other article. Their conclusions were that consuming organic produce does matter and that it is beneficial to your health. So I have included a list indicating some fruits and veggies that should, as much as possible, be purchased organic and a list of produce that it is a little safer to buy non organic. These lists are based solely off of pesticide residues and not nutritional content. The ones that tend to have higher amounts of pesticide residues are considered the dirty dozen(buy organic), and those that have been measured to have lower amounts of pesticide residues are considered the clean 15 (you might get away with eating these non organic). Happy eating!! 1. Marks AR, Harley K, Bradman A, et al. Organophosphate Pesticide Exposure and Attention in Young Mexican-American Children: The CHAMACOS Study. Environmental Health Perspectives. 2010;118(12):1768-1774. doi:10.1289/ehp.1002056. 2. Barański M, Średnicka-Tober B, Volakakis N, et al. Higher Antioxidant and Lower Cadmium Concentrations and Lower Incidence of Pesticide Residues in Organically Grown Crops: a Systematic Literature Review and Meta-analyses. British Journal of Nutrition. 2014;112, pp 794-811. doi:10.1017/S0007114514001366.